Spiraling out of the All Over Albany 2011 Tournament of Pizza, I have an initiative visit each of the pizzerias that made it to the semi-finals round and sample an outstanding pizza creation. While the tournament was all about rating the pizza, this is much less structured, and really serves to create an awareness of something that you might not know is out there. One day, a coworker and I decided to take the quick trip and share a pie at Marisa’s (5 New Karner Road Guilderland, NY) for lunch. Looking at the menu, I had my heart set on the bianca Mediterraneo. Fresh Mozzarella. Italian Proscuitto. Red Onions. Olive Tapenade. Romano Cheese. Olive Oil. Fresh Basil. Garlic. Actually, in speaking with the owner, that’s not his quintessential pizza. According to him, people come from all parts of the capital region for the Florentine, which you can read about on the menu. I wasn’t buying a pizza with no meat on it. However, I will offer the insight that every pizza combination under “Personal Specialty Pizzas” sounds delicious, even the ones with no meat. My coworker and I split a large bianca Mediterraneo. It set us back $17.95. That’s not bad at all; show me somewhere else you can stuff your face for less than $9 per person. The picture is a little deceiving. My cell phone camera lens created a sense of depth that wasn’t truly there. This was a nice and thin pie. It was loaded with toppings, and, when I say that, I don’t want to give the impression that things were jam packed onto this pizza. 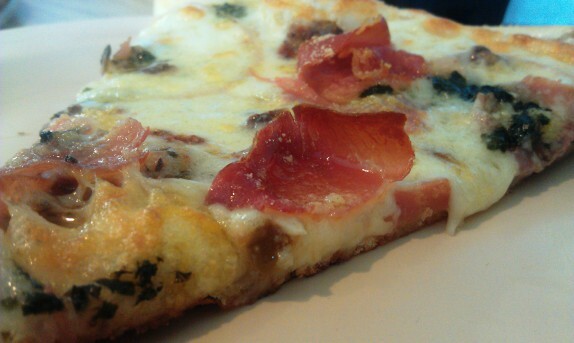 All of the toppings are light to begin with and were placed over the pizza with finesse. I have to admit, there was a bit of a skeptic in me before I got to eat this pizza. For one, every experience I’ve ever had cooking proscuitto has yielded a tough and horrible result. Not the case on this pizza. The thinly sliced, cured meat melded beautifully with the cheeses; I’m sure the olive oil helped. Also, given the amount of flack I give to raw onions on a pizza, I was sure I wasn’t going to enjoy the red onion. Not the case. At all. The red onions were shaved thin and also melded into the pie. 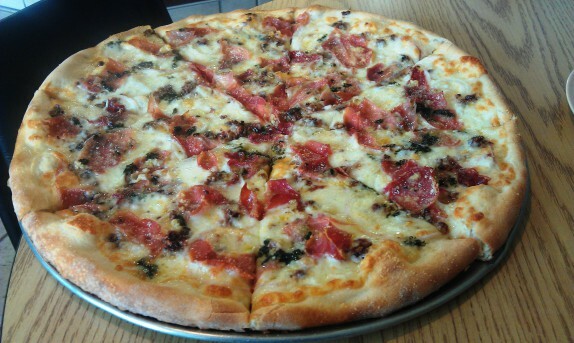 Coupled with the fresh garlic, the aroma from the onions on this pizza was very distinct, and very comforting. The black olive tapenade also had me thinking when I saw it. I generally prefer green olives, but thought that the black olive tapenade was applied in balance with the other ingredients, and added a salty and slightly sour nuance to the pizza. This definitely cut the sweetness in the onions and the cheese. I would urge anybody to stop into Marisa’s and enjoy a warm pizza. The owner is from Italy, and moved to Brooklyn to master the trade. 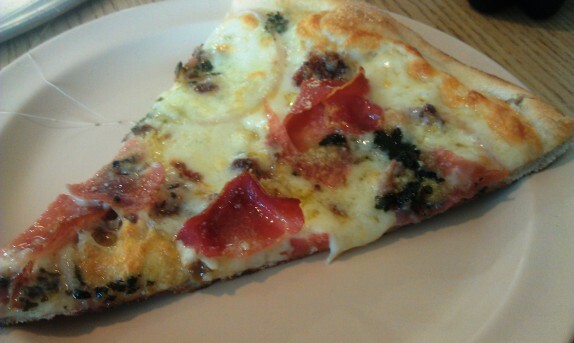 Any pizza you get in the shop will bring you to that coveted Brooklyn experience. Just grab an aranciata from the fridge and enjoy!